Sydney author Stuart Campbell says he is ‘disappointed and upset’ at Lesley Latte’s ambush interview with him in New Caledonia, in which the roving correspondent said that Campbell’s new novel Cairo Mon Amour was set in the 1973 ‘Young Kipper’ War. He has called on the new editor of Charcuterie Monthly, Gilbert Saucisson, to ‘send Latte back to school to learn some history’. 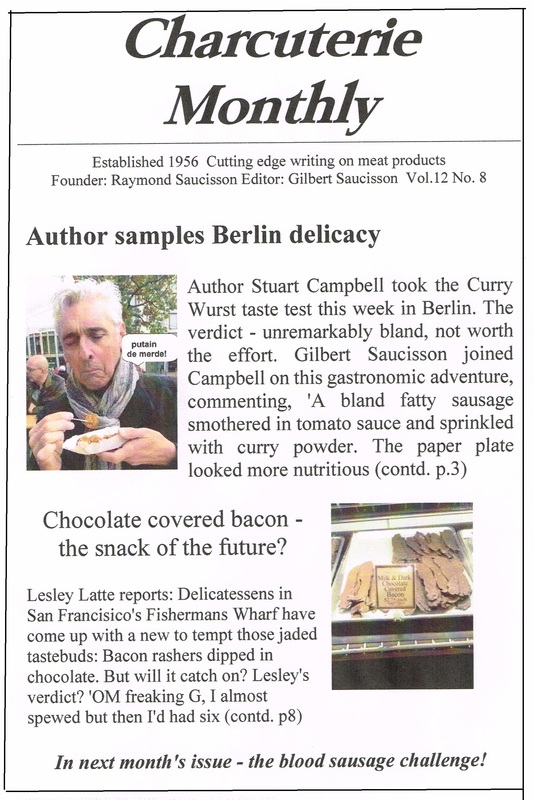 In a brief statement, Saucisson said that Latte would be censured for h** error, adding that Charcuterie Monthly‘s editorial guidelines require that all articles include reference to meat, but not fish. You sir, are a master of parody – well done. Meat not fish, indeed.